Windows can be minimized and closed in the Windows operating system. There is however no option to run programs or windows in the background without icons visible in the taskbar or system tray. That is problematic as it might sometimes be appropriate to hide windows from colleagues, classmates or friends and family. WinHide.SB is a portable software program that can hide Windows quite easily. The program places a program shortcut in the Windows System Tray by default that can be used to hide programs and windows from the taskbar and the system tray. Advanced users can define and use hotkeys to quickly hide and display windows and programs. A right-click on the program icon in the system tray displays options to hide and show windows. Hide window displays all open windows in the operating system while show window only those that have been hidden before. The hotkeys and other program settings can be configured in the program's options. Pressing a hotkey will display the function right on screen. The show window hotkey will for instance display all hidden windows on the screen that can then be selected to be displayed again. Hotkeys can not be assigned to individual program windows which would make the process of hiding and showing windows even faster. The options can also be used to change the icon of the WinHide.SB application, change the hint and to hide it from the system tray as well which would make hotkeys the only way of interacting with the program. WinHide.SB comes with an option to permanently hide windows. We could not really figure out how this is different from the hiding windows option. Our best bet would be that it will remain active even after reboots while the hide windows settings will only remain active for the current session. a simplified, lighter, but not well translated and less user-friendly version of Dexpot Portable (a virtual desktop manager) or similar software. When I tried to download and use this free tool, gave me a warning my antivirus (Avira AntiVir), and therefore did not went on. Anyone else found it as a malignant potential? Greetings! 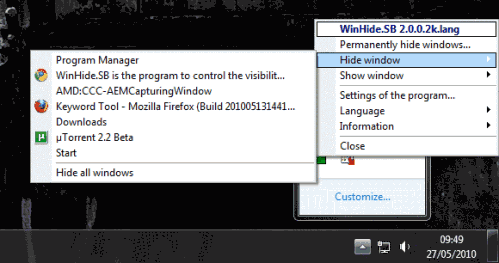 > WinHide.SB comes with an option to permanently hide windows. > We could not really figure out how this is different from the hiding windows option. Hi. I’ve got a problem with a shared PC that has WinHide installed. The icon was left unhidden and now the desktop icons have disappeared, although I’m not sure if this is related. A reboot hasn’t helped. How do you unhide something that’s been permanently hidden? Would this mean uninstalling WinHide? IS hiding desktop icons possible? Nothing’s been set up to do that.